by Russell L Kolts Author · Paul Gilbert Author of introduction, etc. 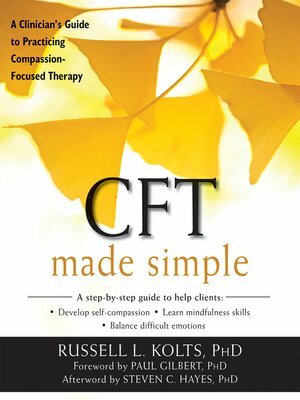 For the first time ever, CFT Made Simple offers easy-to-apply tools to help clients develop self-compassion, learn mindfulness skills, and balance difficult emotions for greater treatment outcomes. Created by world-renowned psychologist Paul Gilbert, compassion-focused therapy (CFT) is extremely effective in helping clients work through painful feelings of shame and self-criticism. However, the theoretical aspects of this therapy—such as evolutionary psychology, attachment theory, and affective neuroscience—can make CFT difficult to grasp. This book provides everything you need to start implementing CFT in practice, either as a primary therapy modality or as an adjunctive approach to other therapies, such as acceptance and commitment therapy (ACT), cognitive behavioral therapy (CBT), and more.